There is something so adorable about seeing our favorite foods in miniature. Amidst all the sparkle, I find myself gravitating towards a tiny snow cone dangling from a chain or small set of petit fours strung on a charm bracelet. Liven up your summer wardrobe with these fun foodie accessories. Whether you want display your love for sushi or affinity for sweets, there is a piece of jewelry to fit your personality and taste. Treat yourself to one of these handmade creations. Show off your sweet tooth with this adorable sweet treat charm bracelet. Everything from a fruit tart, lollipop, gingerbread man, French macaron and more has spot on this silver plated chain. Handmade pink donut treat are the perfect gift for donut or breakfast lovers. This unique piece of jewelry will make on lookers crave this morning sweet. If you are a coffee addict, then this Starbucks inspired Frappuccino necklace is a must-have. The shop also carries a caramel Frappuccino version. Real sushi is almost too pretty to eat so it's no wonder that this necklace would be too. Bright, colorful and charming, faux king crab legs and ahi tuna never looked as it does sitting on your chest. If you haven't jumped on the Nutella bandwagon, it's high time you joined the craze. 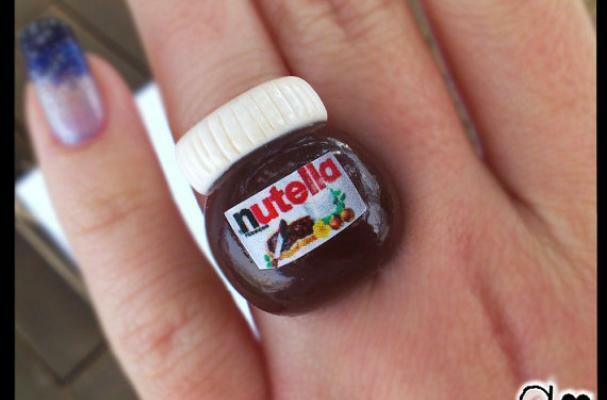 Show your love for this chocolate hazelnut spread with this adorable ring.